We recently hired a developer to completely redesign our website and to help us transition our business from mostly residential-facing to mostly business-facing with a heavy lean towards commercial projects. Have a question or comment? We’d be happy to hear from you – get in touch on our Contact Page or give us a call today! 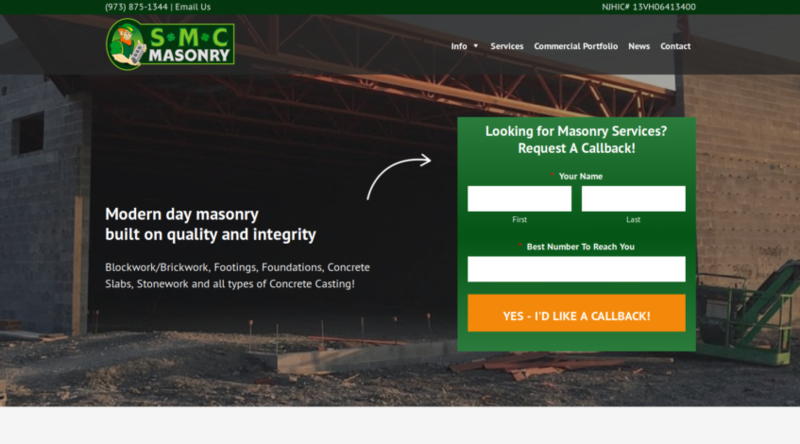 You can learn more about SMC services by clicking here, but… just very briefly, we offer full-spectrum commercial masonry services (footings and foundation, to concrete slabs, brickwork, blockwork, stone work, and all types of concrete casting). Our commitment to you, our customers, is that we are 100% with you from the first consultation through to the finishing touches. SMC is known best for high quality work, competitive rates and early/on-time completion of projects and we pride ourselves on this! Thanks for checking out our new website – we hope to hear from you soon! Have a commercial project you need a bid on? You’ve come to the right place – Click Right Here, then fill out the form on our contact page and we’ll give you a call! SMC in the NJ Herald!